Real Madrid could reportedly have a chance of sealing the stunning transfer of Paris Saint-Germain star Kylian Mbappe within the next 48 hours. Reports claim the Spanish giants are poised to pounce for the France international as his PSG future remains uncertain ahead of his loan move from Monaco becoming officially permanent. 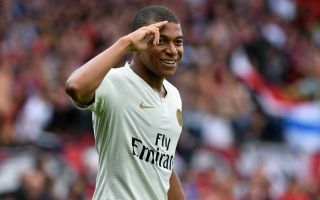 PSG’s Financial Fair Play issues mean it is not yet certain Mbappe’s loan will go through as a permanent £160million transfer as had been expected in the next 48 hours. This gives Madrid an opportunity to swoop for the teenager, who has long been identified by the club as their ideal replacement for Cristiano Ronaldo following his move to Juventus this summer. Mbappe is undoubtedly one of the best players in the world, and had a starring role for the French national team as they won the World Cup this summer. Still only 19, Mbappe has a big future ahead of him and could be at a bigger club than PSG, who have failed to make real progress in the Champions League, despite all their big spending. Barcelona have also been linked with Mbappe in recent times, though that interest may have cooled since they signed Malcom to bolster their attack.